BECAUSE MUSIC MAKES YOUR BRAIN WORK BETTER! Let's Get ALL Keyed Up! We offer private and small group music lessons to both children and adults in the Comox Valley. Our philosophy is teaching the basics of music in an entertaining fashion, focusing on encouraging each student to create music at a comfortable pace. Whatever your musical goals may be, All Keyed Up Music Lessons will help you develop the technical knowledge, skills and confidence to make the music you love! Meet your new favourite music teachers! 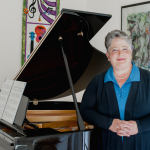 Debbie Ross is a highly qualified, full-time instructor with over 28 years of experience teaching music. In 2010, she became the Royal Conservatory of Music’s representative in the Comox Valley. Debbie’s goal is to make music more accessible to students of all ages, backgrounds and experience levels – her specialty is helping her students get all keyed up about learning! More . . .
Michel Rivero studied at the Eduardo García Delgado Art Instructor School in Havana, where he acquired a diverse knowledge of piano, double bass, percussion, vocal technique and music theory. He teaches guitar privately and conducts various workshops on Cuban percussion. More . . .
Book your lesson or contact us today! © 2018 All Keyed Up. All rights reserved.